The U.S. has one of the smallest icebreaker fleets of all the nations with Arctic borders. Is that set to change? The U.S. Coast Guard could finally be on track to acquire a new oceangoing icebreaker to boost its dwindling polar fleet. The Coast Guard asked for $8 million in its 2013 budget proposal to begin acquiring the new ship, which can scythe through sea ice to clear a channel for other vessels, and could ultimately cost up to $1 billion, according to press reports. The new U.S. icebreaker has been a long time coming. In 2009, then-Coast Guard Commandant Thad Allen formed a task force to study the implications of global warming on U.S. maritime operations. As sea traffic increases in the less icy (but still treacherous) Arctic, the Coast Guard will need more icebreakers to assist commercial and military vessels, the task force concluded. “Icebreakers have the endurance that's sorely needed up there,” Allen said. The United States has one of the smallest icebreaker fleets of all the nations with Arctic borders. The Coast Guard possesses three large icebreakers, each around 14,000 tons displacement. The 1970s-vintage Polar Star and Polar Sea can break up to six feet of ice at three knots. The Healy, commissioned in 1999, can break three feet at the same speed. All three vessels are homeported in Washington state. 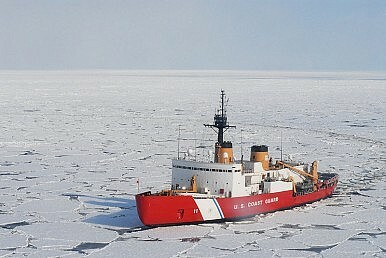 Of America's icebreakers, only the Healy is fully operational.Polar Sea is due to decommission soon. Polar Star is in refit and could re-enter service by the end of the year. A new icebreaker would likely replace Polar Star and sustain a long-term polar fleet of just two ships. Russia, by contrast, operates around two dozen icebreakers, including several nuclear-powered models. To resupply its Antarctic research base in February, Washington was forced to request assistance from Moscow. The icebreaker Vladimir Ignatyuk cut a channel for a U.S. Navy supply ship to reach the research station.